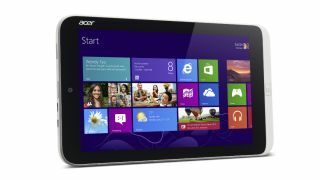 Having finally broken the seal on the Liquid S1 at Computex, Acer went on to announce the Iconia W3, the world's first 8-inch Windows 8 tablet. At 0.45 inches thick and 8.1 inches on the screen, the tablet specs announced today all agree with the leaked specs we'd already heard, and make it the smallest Windows 8-packing slate seen so far. The 1280 x 800 display is capable of 720p playback, with a micro HDMI port for when you need a slightly bigger viewing experience. The front and rear 2-megapixel cameras are nothing to get excited about though. On the inside it's running Intel's dual-core 1.8GHz Atom Z2760 processor, in line with larger Windows 8 tablets. A full-size keyboard with dock is also available with the tablet, which is just as well as the W3 arrives with Office pre-installed for no added price. Meanwhile, Acer promises you'll also get around eight hours out of the slab's battery. Bluetooth 4.0 and micro-USB connections are available, though unfortunately no sign of USB 3.0. The W3 will be available starting June, with the 32GB and 64GB coming priced at €329 (about £280, $427, AUS $445) and €379 (about £325, $492, AUS $512) respectively. Pre-orders will be going live tomorrow.